From 1st – 30th June we are offering a 10% discount on selected Fabric Exhibition Stand lines. This means you can purchase one of our stunning fabric displays at an unbeatable price in one of our largest ever sales. We provide a wide range of fabric displays, all of which offer seamless, edge-to-edge branding. 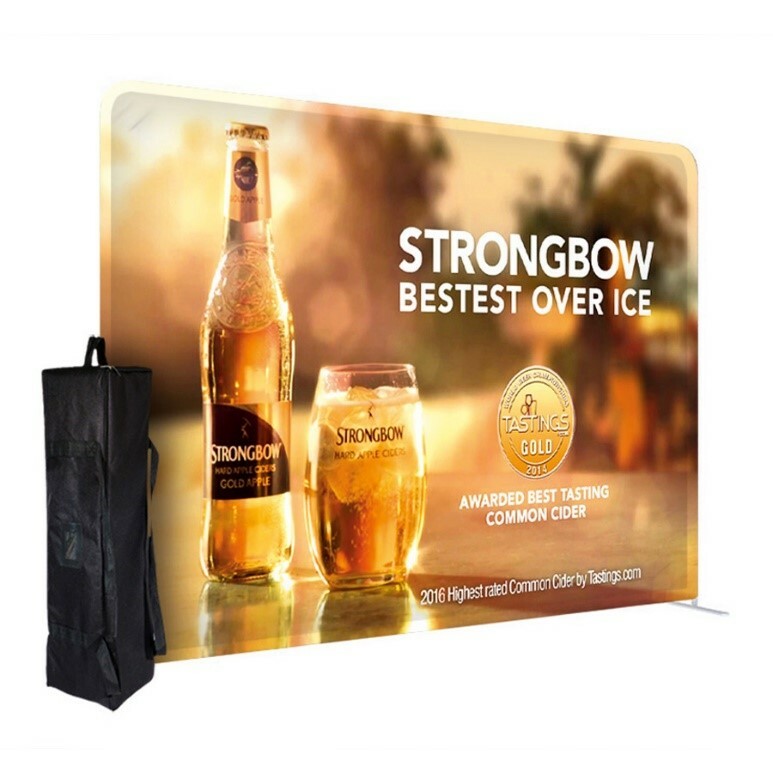 Our bestselling fabric exhibition stands include our Formulate Straight Fabric Display 2.4m, Formulate Straight Fabric Display 3m, Formulate Curve Fabric Display 2.4m and Formulate Curve 3m Fabric Display. All of which are included in our 10% OFF sale, so grab yourself a bargain whilst you can! 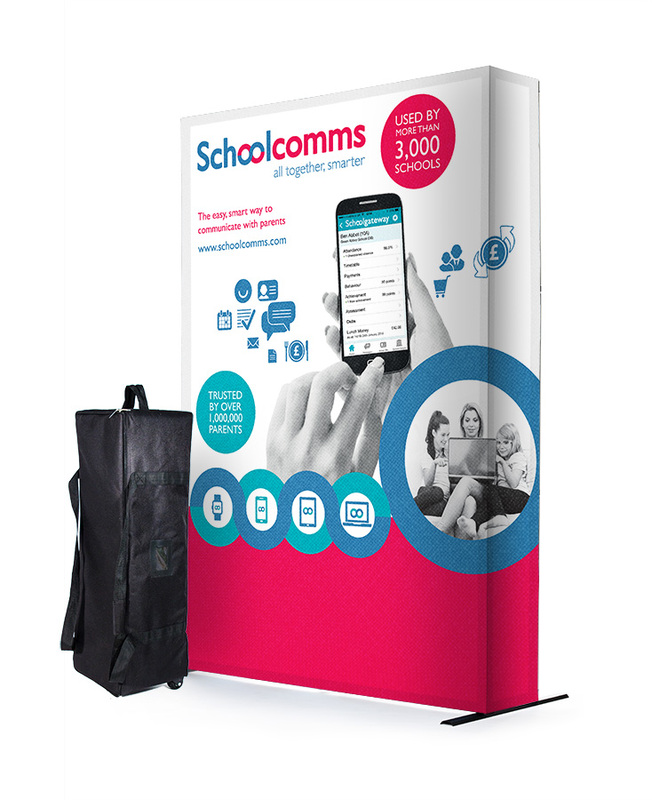 Fabric displays are a sleek and modern alternative to traditional exhibition stands, they are printed with a dye-sublimation printing process, which means the ink is injected directly into the fabric. With traditional exhibition media, graphics are printed on to the PVC. A good comparison to make in order to understand it a bit better is to think of a t-shirt. When a logo or image is printed on to the fabric, it’s often shiny and can crack easily. When a logo or image is printed into the fabric and is part of the fabric itself, the image stays a lot sharper and doesn’t peel or fade. Just like with t-shirts, in terms of displays this means the graphics won’t fade, peel or crack, regardless of how much they are washed, folded or used. It also means they are non-reflective, giving your display a more vibrant and striking appearance when compared to traditional PVC ones. Our fabric sale includes a wide range of products, the first of which being Full Printed Tablecloths. Not only are tablecloths an affordable marketing tool, they are versatile enough to be used alone or as part of a larger display. The brushed cotton finish on the 220gsm polyester ensures sharp and crisp graphics that will complement any product at any event. Full print table cloths offer complete coverage for your brand. 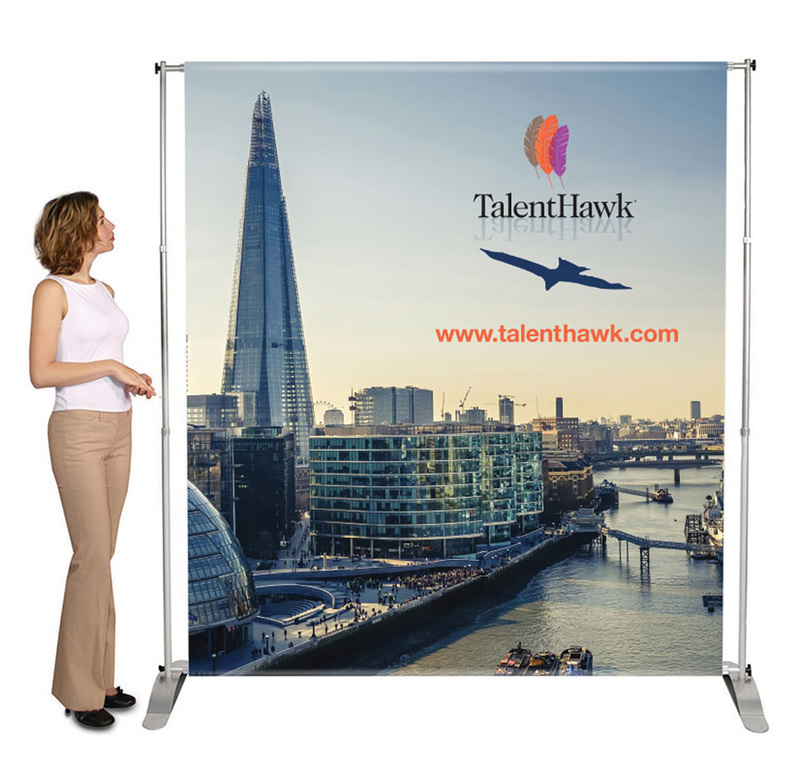 Our full print tablecloths are unique to your brand and requirements, printed using your design and your artwork. For example, you can have a step repeat print of your company logo or a full image covering the entire cloth, the only restriction is the size of your cloth. Available in a 5ft Full Print Tablecloth and 6ft Full Print Tablecloth. Also included in the sale are a range of our bestselling Formulate Fabric Exhibition Stands, including Formulate Fabric Arches, Fabric Banner Stands and a Formulate Meeting Pod. Formulate fabric exhibition stands create a impressive tension fabric display with a seamless finish. Graphics are printed onto a one-piece stretch fabric sock that slides over the top of the lightweight aluminium frame. What’s more, the fabric graphics are machine washable at 30 degrees, meaning you can keep your display brighter for longer. For additional peace of mind, all of our Formulate fabric displays come with a five-year warranty on the hardware, ensuring your investment is protected. Hop-up fabric displays are also included in our summer sale. Hop-ups are extremely unique due to the fact that the fabric graphics are secured onto the frame with extra-strong Velcro. What’s more, you can collapse the frame with the graphics still attached, meaning if you’re taking your display to several events, you only have to attach the fabric once. The fabric that comes with hop-up exhibition display stands has a satin sheen finish, and the frame itself comes with a one-year warranty. Lightweigth, highly portable and available in a range of sizes - 3x1, 3x2, 3x3, 3x4 and 3x5. We have included SEG Exhibition Display Stands in our sale because of the popularity of the product. SEG stands for silicone edge graphics, which means that each edge of the fabric graphic is lined with silicone which is then fed into the frame. This produces a taut and secure tension fabric graphic that won’t come loose. 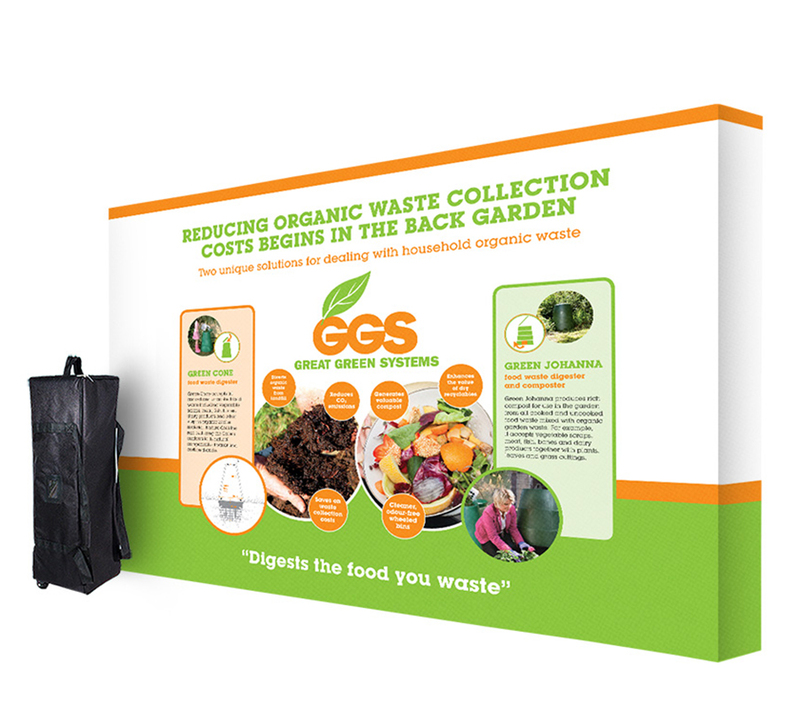 SEG display stands use a traditional pop-up frame, meaning there are no tools required. The final line of products included in our summer sale is Pegasus Display Stands. Comprised of anodised aluminium poles, Pegasus also uses tension fabric graphics to create a stunning fabric display which allows you to tighten the graphics until they are taut and wrinkle-free. The Pegasus 3m Fabric Media Wall is the perfect exhibition backdrop solution, creating a hugely impressive backwall which is perfect for interviews, event photography or just for better promoting your marketing messages. One of the most advantageous points of all fabric displays is the fact that they are so lightweight. They are comprised of aluminium tubular frames which can be fully dismantled and stored away with ease. Even the largest exhibition stands can be transported in any car because of how small the frame is when packed away and the fact that the graphics can simply be folded up. The unique selling point of most fabric exhibitions is that the graphics affix to the frame via a one-piece stretch fabric sock that simply slides over the frame. This is where they excel over their traditional display counterparts which are made of PVC or vinyl. Fabric displays have an abundance of benefits over traditional exhibitions, but they also retain some of the same great basic features, such as the ability to support accessories such as lights and shelves. With so many advantages, now is a prime time to invest in a fabric display solution whilst we are offering 10% off. All you to need to do is enter the code ‘10FAB2018’ at the checkout online or quote the code to one of our sales team over the phone. The offer entitles you to one discount per person either online or over the phone, and it is valid from 1st – 30th June. Don’t miss out on a bargain, get your fabric display today! At XL Displays, we are award winning specialists in providing cost-effective Exhibition Stands and Portable Display Solutions. For more information about our Pop Up Stands, Fabric Exhibition Stands, Branded Tablecloths or any other products, please contact us or call our sales team on 01733 511030.